Do you ever have an intention to make a certain dinner, then you look at it and you went completely the opposite way? That is how this recipe came about. I was going to make a Mediterranean dish, then when I was looking at it as I was putting it together, and I thought I want Chinese Stir-Fry. 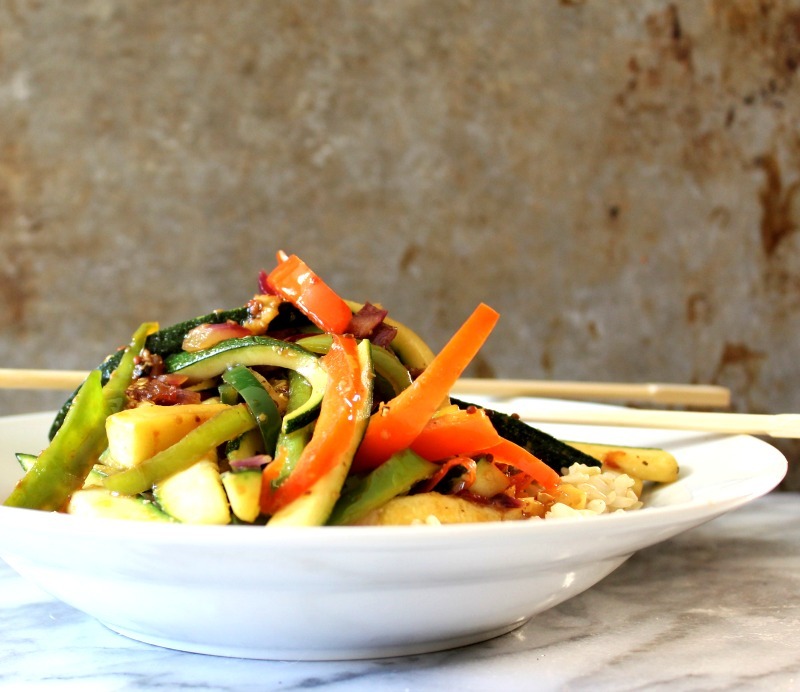 I haven’t had stir-fry in forever, and I thought the base of my recipe is simply perfect to make into a spicy stir-fry and it’s quick too. I was pretty hungry! 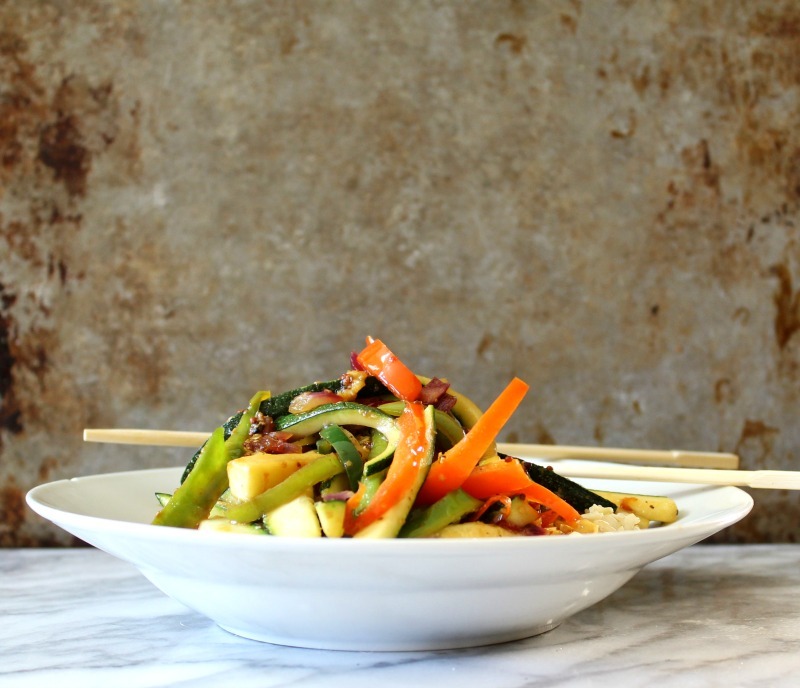 Today’s recipe is Zucchini Pepper Stir-Fry. This dish is light, refreshing and has a nice kick of heat. I bought some fresh zucchini from the Farmers Market and used the peppers from my garden. This recipe has simple ingredients, but has a lot of flavor. It’s simply perfect for a quick weeknight meal. You can use a combination of the vegetables you like. Snap peas and carrots would be a great addition, but I went simple with the recipe. Plus I was doing my refrigerator clean-up and this is what I had on hand. I really try not to waste to many ingredients. Use your imagination and go wild with what you love! The sauce is made with low sodium soy sauce, chili paste, and dijon mustard. 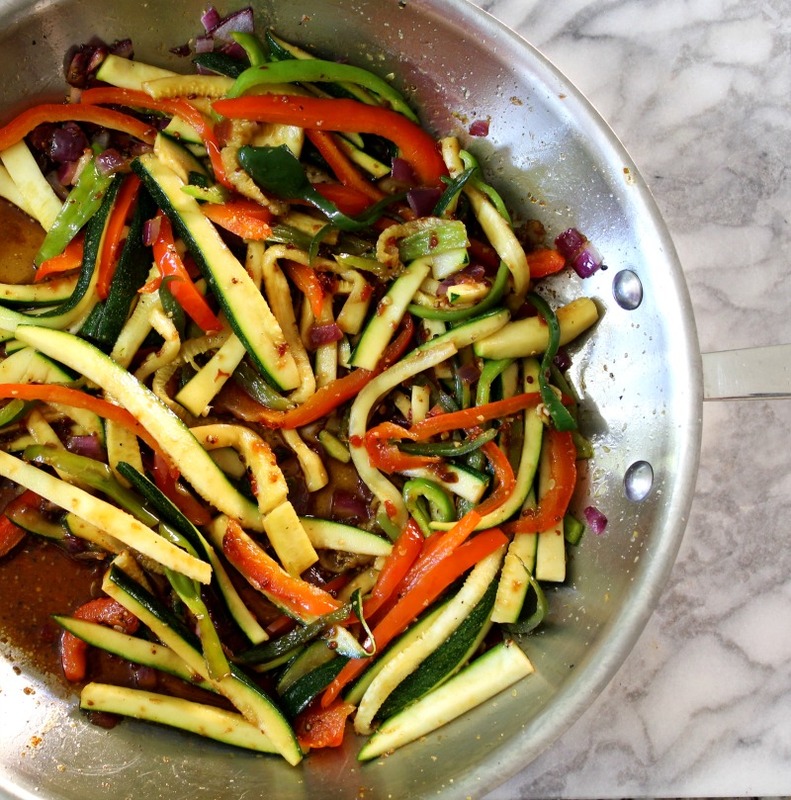 It’s salty and spicy and perfect with zucchini and peppers. I just poured it all over my vegetables, once they were done cooking. I served the vegetables over a bed of brown rice. I cheated and used Trader Joe’s microwave Organic Brown Rice. I love it because it is only 3 minutes in the microwave and you are done! 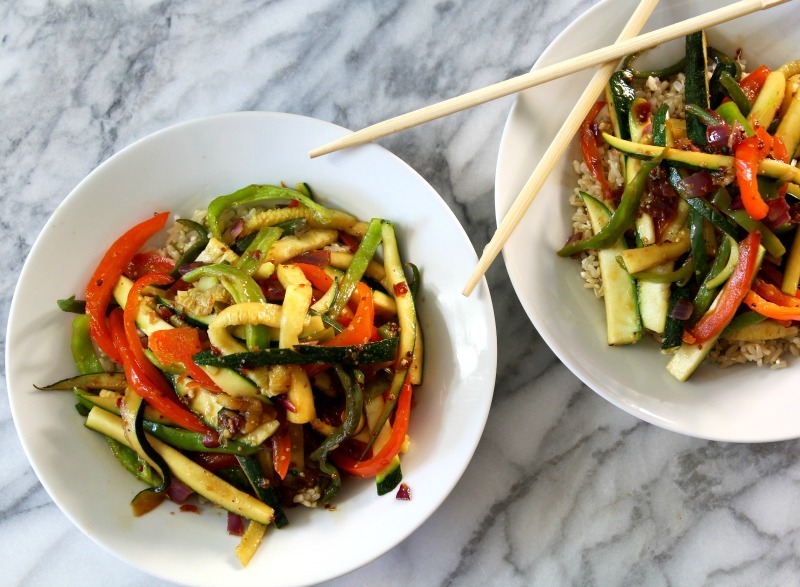 A fresh, a little spicy stir-fry made with zucchini, and peppers with a soy and chili paste sauce served on brown rice. Cook rice according to direction. I used microwave rice from Trader Joe's. In a large fry pan; over medium-low heat, add 1 tablespoon of sesame oil. Heat oil for about 30 seconds, add garlic, and cook for 1 minute. Add onion and peppers, stirring occasionally and cook for about 4 minutes. Add zucchini and cook until slightly tender, but still firm, stirring occasionally. Turn off heat and stir in sauce. 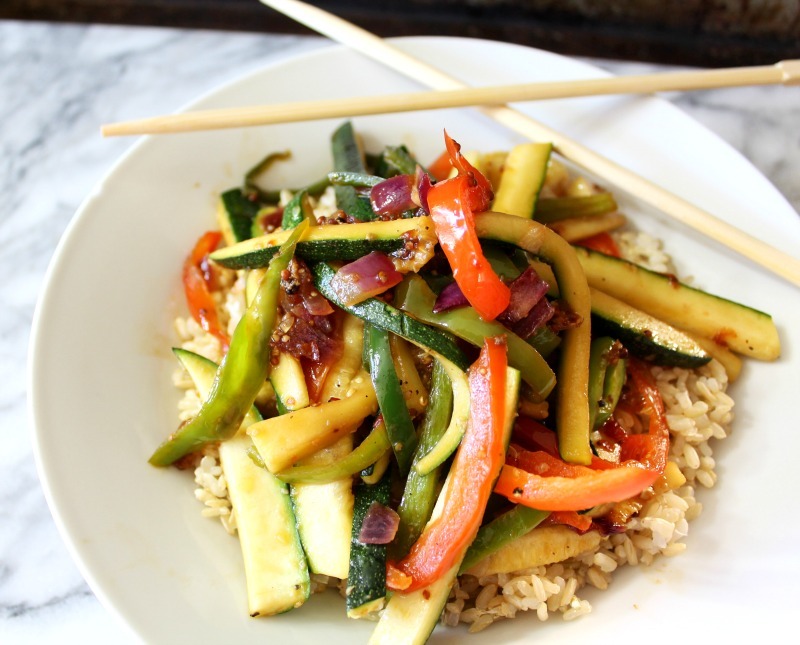 Divide, rice between two bowls, and evenly divide vegetables. For a pinch of heat, I added sriracha sauce to the stirfry. In a bowl, add soy sauce, sesame oil, chili paste and mustard; mix until combined. Use any vegetables that you like, such as carrots, water chestnuts and snap peas. I love these kind of recipes. Guilt-free, easy to make and so much flavor. You can’t beat these kind of weeknight meals. Remember to just use up what you have on hand, if you don’t have zucchini, add celery and carrots. If you don’t like poblano peppers, add bell pepper. There are so many ways to go and as long as you like the vegetables added that is all that counts. What a tasty lunch…made it like yours except I added chickpeas for protein and added a few peanuts for crunch. I always have all of these ingredients on hand, so I’m sure this will be a make-again for a quick, easy, healthy meal! Thank you.